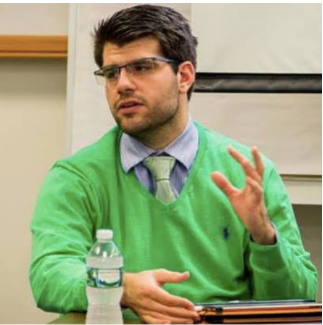 Guest Blog by Austin Schiano: who is an international political communications professional, with experience in the private sector, UN, Media and NGO space. He received his Master’s Degree in Global Affairs from NYU’s School of Professional Studies in 2015. First published here. In the wake of U.S. President Donald Trump’s withdrawal from the Paris Climate Accord, I was scouring to understand how this decision would affect present and future progress in combatting climate change. After some thought, it became clear that the behavior of businesses would be key. I found myself musing over several questions: Would this withdrawal act as a signal to affect corporate behavior on combating climate change? And, more importantly, what could we as consumers do to understand and encourage sustainability if the U.S. government was stalled on the topic? To help get our bearings, it’s important to understand the effect of lobbying efforts in the U.S. The Internal Revenue Service defines lobbying as an attempt to influence a legislative body through communication with a member or employee of that institution or government official. In essence, lobbyists try to convince legislators to take a specific position that would help the corporation (or other entity) that is financially backing the lobbyist. In 1995, Congress passed the Lobbying Disclosure Act that requires companies or other entities to register federal lobbyists to help ensure transparency and accountability. While attempting to protect the branches of government, U.S. representatives and the inherent value of the legislative process, the Act also provided a data source for understanding the true impact of lobbying. In a report published in the Academy of Management Discoveries (AMD), researchers analyzed this data over time and found that corporations with high levels of greenhouse gas emissions and corporations who emitted the least greenhouse gases both spent the most money and directed lobbying efforts around climate issues. This is very important when we try to understand the forces at work when energy legislation is on the docket. In the U.S., climate lobbying has been most active when environmental legislation has been under consideration. The AMD report showed that from 2006-2009, corporations spent over $1 billion USD on lobbying efforts surrounding the proposal of the American Clean Energy and Security Act in the House of Representatives. Spending on climate and environmental-focused lobbying has only increased since 2009. Data from the Center for Responsive Politics organized by the Senate Office for Public Records estimates that $3.9 billion USD was spent between 2009-2014 on climate and environmental lobbying. What this means is that corporations are spending large sums of money lobbying on climate issues. The U.S. Government lobbying data set, however, does not identify whether those who lobbied were for or against a specific legislative issue. We would have to conduct a more detailed analysis of the corporations’ behavior to get a better sense of their position on the legislation. In a brief examination of major companies, Pacific Gas and Electric (PG&E) presents a case study for their support of managing carbon emissions. The company spent an estimated $27 million USD on climate change lobbying in 2008, while also supporting a cap-and-trade system for emissions. PG&E demonstrated their commitment further by leaving the Chamber of Commerce in 2009 due to the Chamber’s fervent opposition to carbon regulation. Nike Inc. likewise resigned from the Chamber’s board of directors in 2009 for similar reasons. So, what can we as consumers do to influence the manner in which corporations lobby? A key answer lies in shareholder resolutions, which are non-binding recommendations to the board of directors of a public corporation. These shareholder resolutions are public and filed with the U.S. Securities and Exchange Commission (SEC). If a large enough constituency of shareholders coalesce around a shareholder resolution, they can encourage further advocacy for a change of corporate policy. This is where things get interesting. Following the 2015 United Nations Climate Change Conference, which resulted in the Paris Agreement, “the number of climate-related shareholder resolutions worldwide hit an all-time high.”Additionally, according to The Earth Institute at Columbia University, “of the 370 shareholder resolutions filed in 2016 relating to environmental and social issues in the U.S., a record 94 were related to climate change.” Shareholder resolutions are being used increasingly to bring climate issues to the forefront. Reviewing corporate lobbying is one of the most powerful tools we consumers have to guide the private sector toward a more sustainable future. This article is the start of a critical conversation, on which our planet cannot afford to wait. Some corporations are making valiant strides toward environmental protection, but ‘some’ will not save us. We have pushed the earth to a dangerous tipping point and there will be no going back if we cross it. Shear, M. (2017), “Trump Will Withdraw U.S. From Paris Climate Agreement”, https://www.nytimes.com/2017/06/01/climate/trump-paris-climate-agreement.html. The Internal Revenue Service. (2017), “Direct and Grassroots Lobbying Defined”, https://www.irs.gov/charities-non-profits/direct-and-grass-roots-lobbying-defined. Usman, H. (2013), “Corporate Lobbying: Can Transparency Mitigate the Risk for Investors?”, https://blogs.cfainstitute.org/investor/2013/06/27/corproate-lobbying-can-transparency-mitigate-the-risk-for-investors/. US Congress. (1995) “Lobbying Disclosure Act of 1995”, https://lobbyingdisclosure.house.gov/lda.html. Delmas, M, Lim, J, and Nicholas, N. (2016) “Corporate Environment Performance and Lobbying”, https://www.ioes.ucla.edu/wp-content/uploads/amd20140065_rp1.pdf. U.S. House of Representatives. (2009), “H.R.2454 – American Clean Energy and Security Act of 2009”, https://www.congress.gov/bill/111th-congress/house-bill/2454. Delmas, M. (2016) “Research: Who’s Lobbying Congress on Climate Change”,https://hbr.org/2016/10/research-whos-lobbying-congress-on-climate-change. Goldman, G, Rogerson, P. (2013) “Assessing Trade and Business Groups’ Positions on Climate Change”, http://www.ucsusa.org/sites/default/files/legacy/assets/documents/center-for-science-and-democracy/trade-and-business-groups-climate-change.pdf. USSIF. (2017) “Shareholder Resolutions. US SIF: The Forum for Sustainable and Responsible Investment”, http://www.ussif.org/resolutions. Hulac, B. (2016) “Exxon Mobil Faces Showdown with Shareholders over Climate Change”, https://www.scientificamerican.com/article/exxonmobil-faces-showdown-with-shareholders-over-climate-change/. Hapgood, H. (2016) “Shareholders Turn Up the Heat on Climate Change”, http://blogs.ei.columbia.edu/2016/10/12/shareholders-turn-up-the-heat-on-climate-change/. While political will is and will remain imporant- we as consumers and citizens have other pressure points too. Good read and food for thought.